India scored 436 in their first innings to take a 11-run lead over Sri Lanka and then scalped two quick Sri Lankan wickets to gain a slight upper hand in the third and final cricket Test at the P Sara stadium on Thursday. Both the Sri Lankan openers Tillakaratne Dilshan (13) and Tharanga Paranavitana (16) were dismissed by Virender Sehwag, leaving the hosts at 45 for two from 16 overs. Skipper Kumar Sangakkara (12) and night-watchman Suraj Randiv were at the crease at close of play. India got off to a disastrous start on day three, losing a wicket in the first over of the day. The visitors suffered the first blow when Sachin Tendulkar (41), who became the most-capped Test cricketer in the match, flashed his bat on an away going delivery off Lasith Malinga without much foot movement to be easily taken behind the stumps by Prasanna Jayawardene. Resuming the day at 97, Sehwag completed his century in style with a four off pacer Lasith Malinga before he fell nine runs later. 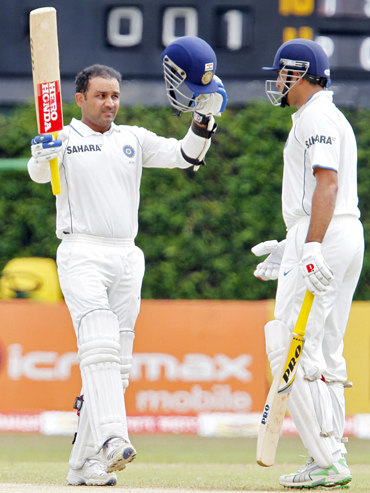 It was Sehwag's 21st Test hundred. Sehwag, who a day earlier had become the sixth Indian player to reach 7,000 runs or more in Tests, consumed 105 balls in his knock of 109 with the help of 19 fours. However, he followed Tendulkar to the pavilion five overs later falling to Malinga, caught by Suraj Randiv at mid-off. Thus, India lost two crucial wickets inside the first half an hour of the morning session. 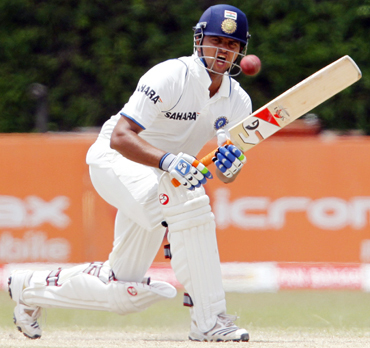 Sehwag is, however, the leading run-scorer for India in the present series against Sri Lanka with 348 runs. India though consolidated their position thereafter reaching 282 for four at lunch. Resuming at 180 for two, India added 102 runs from 29 overs in the morning session at the expense of two crucial wickets. VVS Laxman (56) and Suresh Raina (62) shared a crucial 105-run partnership for the fifth-wicket. 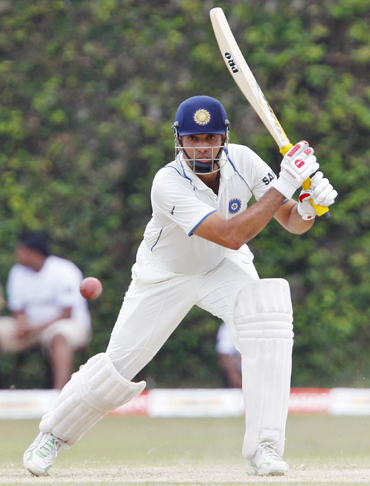 Laxman's patient 97-ball knock was inclusive of seven boundaries. However, the veteran fell to Ajantha Mendis at a crucial juncture. Laxman failed to negotiate Mendis's round-the-stumps carrom ball and squeezed it straight to Jayawardene, who took a sharp catch at first slip to leave India at 304 for 5. Suresh Raina (62) carried on his good work. Having made a century on debut in the second Test at the SSC, the23-year-old made a half century on this occasion. Raina took some time to settle down before pulling an Ajantha Mendis delivery past the square leg and followed it by sweeping the same bowler to the backward square leg boundary in that over. As he gained in confidence, Raina drove carrom bowler Mendis for yet another boundary before giving Suraj Randiv the same treatment later on. He was fortunate though that a Randiv flighted ball spun from around the off stump but it dropped well short of point fielder. However, Mendis came back to have his revenge and haunt the Indians again a few overs later as he got his carrom ball to cut in from outside off stump as Raina popped it straight to short midwicket. But Abhimanyu Mithun (46) and Amit Mishra (40) did enough to ensure the visitors a slender lead.